Charles Urban, American film pioneer, 1911. 'An Appropriate Text! 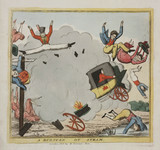 ', satirical ballooning sketch, c 1842. 'Phrenological Office for Servants', 1805-1830. 'Hot goose cabbage and cucumbers', August 1823. Sir Sam Fay, c 1900s. 'A Burster by Steam', c 1835. 'The Golden Remedy - or Electrical Panacea', 1818.